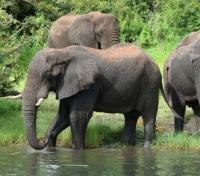 Embark on a boat safari in search of bathing elephants. 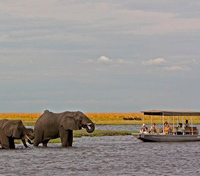 Sail along the Zambezi River on a sunset cruise. 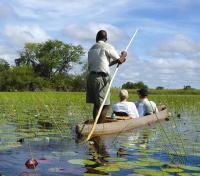 Explore Victoria Falls with your expert guide. 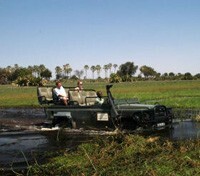 Search for the Big 5 on daily safaris by foot, 4x4, and boat. 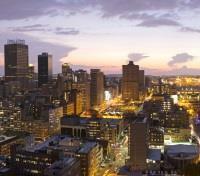 Board a flight in Johannesburg with direct service to Victoria Falls. Approximate travel time is one hour and 30 minutes. Please note, luggage restrictions apply to this regional flight: 1) Maximum of one checked bag, weighing up to 50 lbs (23 kg); Checked baggage cannot be larger than 35”x29”x17” (90cm x 75cm x 43cm). 2) Guests can also bring one piece of carry-on luggage with a maximum weight of 17lbs (8kg); carry-on luggage cannot be larger than 22”x14”x9” (56cm x 36cm x 23cm). Guests may also bring one slimline laptop bag. 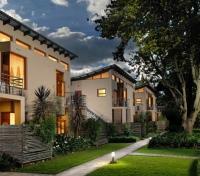 Transfer between the Victoria Falls Airport and your lodge with a private driver and vehicle. 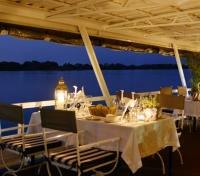 Enjoy your Zambezi Reflections dinner cruise tonight. 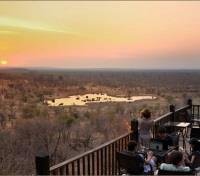 Celebrate the sunset as you cruise the Zambezi River upstream of the Victoria Falls. The Dinner cruise is a luxury safari on water. Zambezi Reflections is a dedicated floating restaurant offering gourmet meals on the mighty Zambezi River above the Victoria Falls. Similar to its sister vessel, The Zambezi Explorer, it is quickly gaining the reputation as the premier dining experience on the river and is perfect for either group bookings or individual travelers. At the end of the day, sail upstream to celebrate the setting African sun. Share in the end-of-day ritual which sees wild herds streaming to the river banks for their last drink. Flocks of birds skim the waterline as the sun sets behind the African skyline. Bring a camera and create your own golden memories. Set high on a natural plateau, the westward facing Victoria Falls Safari Lodge borders the Zambezi National Park and is just four kilometers from the thundering Victoria Falls, one of Southern Africa's most famous attractions. 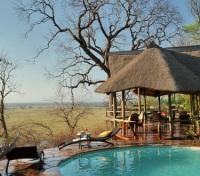 Enjoy magical views of the spectacular African sunsets and year round wildlife at the on-site waterhole. 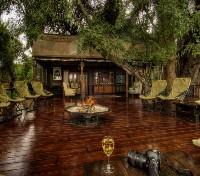 This award winning flagship lodge has 72 en-suite bedrooms with private balcony to enjoy exquisite views of the African landscape. 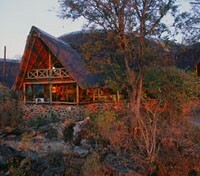 Located within the Victoria Falls Safari Lodge’s central hub, MaKuwa-Kuwa Restaurant features delicious cuisine. The open-plan Buffalo Bar is the perfect venue for all-day refreshments, snacks, light meals and cocktails. The Boma – Place of Eating provides a unique cultural experience that bombards the senses with the tastes, sights, sounds and smells of Africa, together with the warmth and hospitality of Zimbabwe and its people. 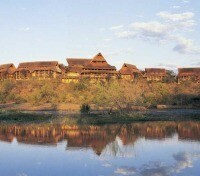 Guests staying at Victoria Falls Safari Lodge enjoy a courtesy shuttle to and from The Boma. Sunbathe by the swimming pool on the sun deck or relax in the guest library and games room. 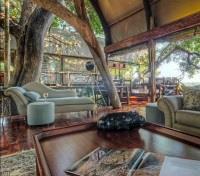 Situated in the lodge, the activities desk is available for guests wishing to arrange exciting guided safari walks, bird watching, private bush dinners and more! 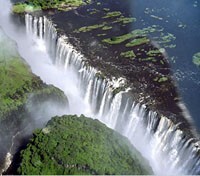 The Victoria Falls – Now In Its 150 Millionth Fantastic Year - Reaches Its Zenith In About May Each Year. It’s a truly awe-inspiring experience – the sight, the sound, the smell; the humbling feeling that here indeed is Nature’s Supreme Masterpiece. No photograph can begin to depict the reality…and nothing prepares you for your first sight. 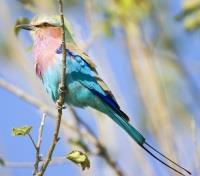 This tour is conducted in the morning and afternoon. En route, you may be taken past the ‘Big Tree’ where you may stop and take photos. You will be accompanied through the Rainforest by one of our qualified Guides who will give a brief history of the Falls themselves as well as detailing the flora, fauna, bird & wildlife and other points of interest. Guides are also happy to assist you with photographs whilst visiting this most spectacular of waterfalls. Raincoats are provided when needed. 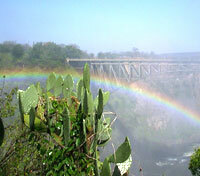 Transfer between Victoria Falls and Kasane by private vehicle and english speaking driver. 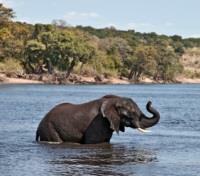 Gliding across the picturesque Chobe River is considered by many as one of the finest game viewing experiences in all of Africa. Boasting from 80000 to 120000 plus elephants in the park alone provides visitors with very frequent sightings of these majestic creatures along the waterways and flood plain-lands. 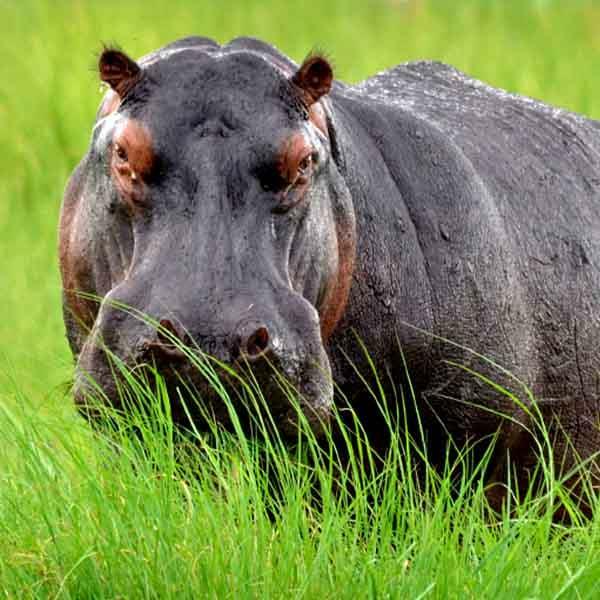 Other African wildlife including hippos, buffalo, crocodiles, and water fowl are also often seen on these dynamic waters. Take your flight from Chobe (light aircraft from Kasane) to Okavango on Mack Air today. 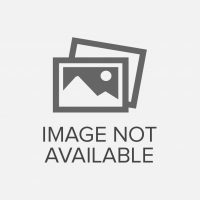 Includes departure tax. Today you'll have plenty of options, a walking safari is just one of them. Professional guides accompany you as they teach you about the bush from a different perspective, up close and personal with the environment. A walking safari is the perfect way to awaken your senses where you can touch, feel and smell the African bush while listening to the various interesting stories the guides have to tell. Walks allow you to read the news of the night in the smooth sand of the road. 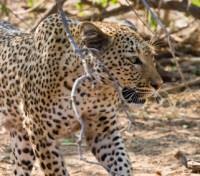 Lion, leopard, elephants, genets and even millipedes are all part of the signs, each with their story to tell. 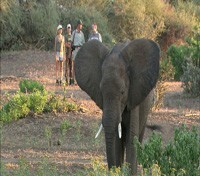 A walking safari is about seeing the small five and the various flora in the area.